Interim Baltimore City Police Commissioner Gary Tuggle announced on Thursday police will not be performing background checks for other city agencies for the foreseeable future. 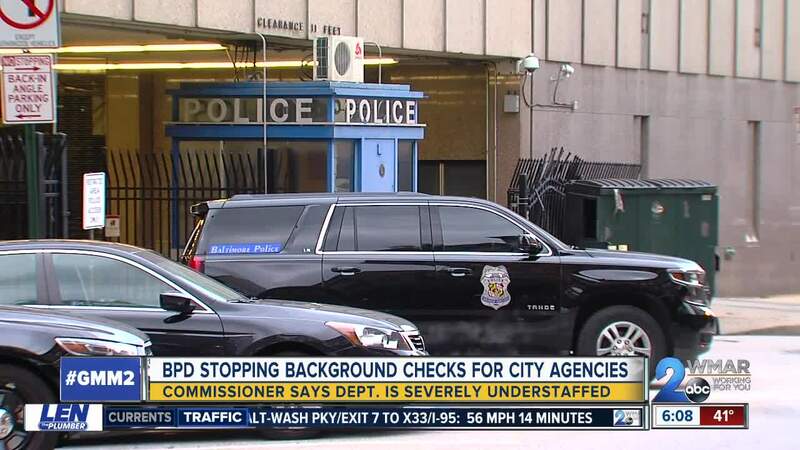 BALTIMORE — Interim Baltimore City Police Commissioner Gary Tuggle announced on Thursday police will not be performing background checks for other city agencies for the foreseeable future. The announcement comes on the heels of a new schedule for officers in hopes of getting more patrols on the streets. Tuggle said on Thursday the department is severely understaffed and they need to use all possible resources to do their own background checks for incoming officers. "We are understaffed across the board, you can’t hide that. That is evidence,” said Tuggle. Under the old schedule, police officers would work four days a week for 10 hours a day, but now they are working eight hour shifts five days a week. Tuggle says this switch has enabled the department to schedule 66 percent of their patrol workforce compared to the 50 percent they were able to schedule before. While the schedule change and suspended background checks for other agencies aren't going to change the city overnight, Tuggle says he thinks the department is moving in the right direction. "Overtime we are very optimistic about that as we continue to add to our patrol ranks through our academy graduations. We are certainly headed in the right direction," Tuggle said. But heading in the right direction means the department needs more people applying to become officers. While he says they are seeing a little over 80 applicants a week, there are still challenges on hiring right now. "Within that recruitment effort we compete not just against other police agencies, but other professions because we have an economy that is so good right now. So it makes it a little harder for us," said Tuggle. Tuggle continued to say they need to see their training capacity increased so they could swear in more officers more quickly. Tuggle says if a person applies to become an officer, they can be sworn into the department in as little as four to six months if there are no issues in their application. There are 1,062 officers currently sworn in across all nine districts on patrol, but some of those officers aren't able to patrol the streets because they need to investigate previous crimes or work in other departments. "I'm going to say it, we have to spread the paint across the entire agency. Patrol is our number one priority, but we can't ignore the other things," explained Tuggle. Tuggle ended Thursday's conference by saying there is a lot that goes into who is able to patrol and how many people we have on the streets, but this new schedule change has helped, and the department is heading in the right direction.